The face of Catholic America is changing. Today, immigrants make up a considerable share of Catholics, and many are Hispanic. At the same time, there has been a regional shift, from the Northeast (long home to a large percentage of the Catholic faithful) and Midwest to the Western and Southern parts of the U.S.
Catholics are more likely than other Americans to be immigrants or children of immigrants. Indeed, more than a quarter of U.S. Catholic adults (27%) were born outside the country, compared with 15% of U.S. adults overall; most of these Catholic immigrants (22% of all U.S. Catholics) are from elsewhere in the Americas. 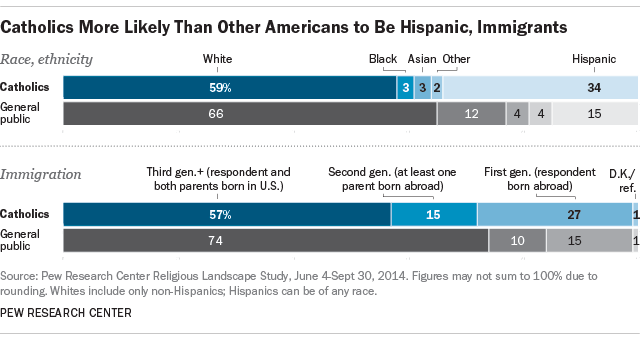 As of 2014, an additional 15% of Catholic Americans have at least one foreign-born parent. That leaves 57% of Catholics who were born in the U.S. to two native-born parents. By comparison, nearly three-quarters (74%) of American adults overall were born in the country to two U.S.-born parents. The share of U.S. Catholics who are Hispanic has grown by 5 percentage points since 2007 (from 29% to 34%), while the percentage of all U.S. adults who are Hispanic has grown by 3 points (from 12% to 15%). And the share of Catholics who are Hispanic is likely to continue to grow; among Catholic millennials, as many are Hispanic (46%) as are white (43%). Catholics are about as diverse as Americans overall, but their specific racial and ethnic composition is somewhat different. Compared with all U.S. adults, Catholics are made up of fewer non-Hispanic whites (59% vs. 66%) and blacks (3% vs. 12%) and more heavily made up of Hispanics (34% vs. 15%). Over the last several years, the Catholic population in the U.S. has shifted somewhat from the Northeast and Midwest toward the South and West regions of the country. Catholics still are more heavily concentrated in the Northeast than are Americans overall (26% vs. 18%). But between 2007 and 2014, the shares of U.S. Catholics living in the Northeast and Midwest have each fallen by 3 percentage points (from 29% to 26% and from 24% to 21%, respectively). And the shares living in the South and West have each increased by 3 points (from 24% to 27% and from 23% to 26%, respectively). When it comes to race and ethnicity, Catholics in different areas of the country are very different. And indeed, the growing share of Hispanics – especially in certain regions – is linked to the shift in Catholic geography. Six-in-ten non-Hispanic Catholics live in the Northeast (32%) or Midwest (28%), while roughly three-quarters of Hispanic Catholics live in the South (33%) or West (44%). Looked at another way, in the Northeast (75%) and Midwest (82%), three-quarters or more of Catholics are white (and non-Hispanic), while fewer than one-in-five are Hispanic. But in the South, just 50% of Catholics are white and 42% are Hispanic. And in the West, a clear majority of Catholics are Hispanic (57%), compared with 31% who are white (as well as 8% who are Asian). In the two most populous U.S. states, even bigger shares of Catholics are Hispanic – fully two-thirds of Catholics in California (67%) and roughly seven-in-ten Catholics in Texas (72%) are Hispanic. American Catholics are aging. The median age of Catholic adults in the U.S. is 49 years old – four years older than it was in 2007. Catholics are significantly older than members of non-Christian faiths (40) and people who are not affiliated with any religion (36). Just 17% of Catholic adults are under the age of 30, compared with 22% of U.S. adults, 35% of religious “nones” and 44% of U.S. Muslims. For more details on demographic measures including fertility, marital status, education and income, see Chapter 3 of the 2015 Pew Research Center report “America’s Changing Religious Landscape,” and an interactive tool with data from the report.